Clear aquamarine water packed with beautiful marine animals. A secluded beach with calm water just waiting for you. It is not just your Monday morning fantasy. It is a reality when you book Coral Kai. A five-bedroom luxury villa, this location sits right beside the waters of Rum Point, the best place for snorkeling on the entire island. Spend your days in your fins and your evenings enjoying the view outside the oceanfront windows or the ocean breezes in the outdoor dining area. Complete with a freshwater pool for a quick dip before you head to the ocean, up to ten people can enjoy this chance at snorkeling perfection. Beachfront on the north coast of Rum Point! 5BR & Den/5BA Luxury “Coral Kai” Villa is oceanfront in Rum Point on the north coast. 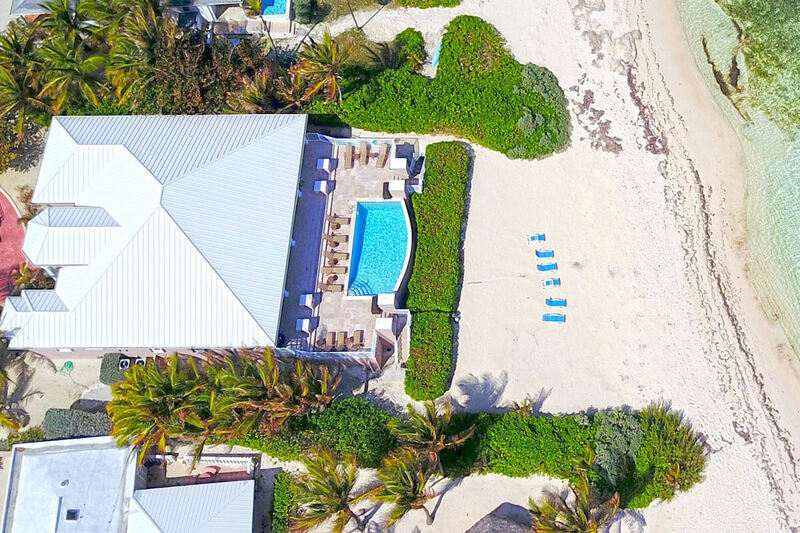 This one-story villa offers excellent snorkeling directly behind the oceanfront pool and a very sandy beach that offers long walks in either direction. Pool shoes/fins are required for swimming or snorkeling anywhere there is a marine environment. Many oceanfront windows and French glass doors to the sea flood the villa with sunshine year-round. Full width shaded veranda offers guests a respite from the sun with sectional sofas, tables, chairs and sun loungers. Superb wedding venue. (2) King Suites; (2) Queen Suites; (1) Twin bedroom with bathroom just outside bedroom door. Although the other suites all have individual TVs, there is a separate TV room in the den to keep the noise of TV viewing from interfering with the sounds of the ocean and trade wind breezes. Large oceanfront freshwater pool with lounge chairs and dining tables. Very sandy beach. Charcoal BBQ near pool. Modern kitchen, indoor and outdoor dining areas, central A/C, Wi-Fi Internet access included. Plasma TV and stereo in den. Circular driveway with plenty of off-street parking. Accommodates up to 10 people (10 adults max. ); Excellent large family or 2-5 couple villa and twins can be made up as a king bed for a 5th couple. The photos can’t do Coral Kai justice. It was the perfect place for 8 of us, had a great location on the North Side, and was 1.25 miles from Rum Point. It’s easy to get to East End (20 minutes to Tukka’s). We would definitely stay here again! I will use WhereToStay again. It’s my first place to look for vacation rentals from here on. Sharon was great. She returned calls, emails, and her and I got along as if we’ve known each other for years! The villa truly is just like the pictures! The open patio runs across the entire front of the villa, so you have a constant view of the pool and beach. You are close enough to hear the waves, there’s easy access to a soft-sand beach with comfortable chairs. The 8 of us cooked all of our meals right at the house- kitchen was very well stocked, even with a professional-grade waffle maker. This house had an amazing supply of hot water for showers, laundry, and dishes, which has not always been our experience while vacationing at various islands in the Caribbean. I would have no qualms about returning to this villa in the future! Sharon was fabulous throughout the entire process of selecting a vacation villa along with car rental and island info. Her responses were always timely and informative. We’ll definitely be in touch for next year’s trip. Coral Kai is a very clean waterfront villa with wonderful views and a sandy beach. It can be very windy when the north easterly trade winds are blowing. We enjoyed the week and the restaurants at Kibo and Rum Point, which are not far away. Sharon was very helpful and gave an accurate description of the villa. Thanks so much for sharing your beautiful place with our family. The kids enjoyed the villa so much they didn’t want to go on any excursions and always asked if we could go back to the villa. The place was great! Loved our stay and view. We all had an awesome time at Coral Kai and highly recommend it to families visiting there! Our service from WhereToStay and Sharon was great!